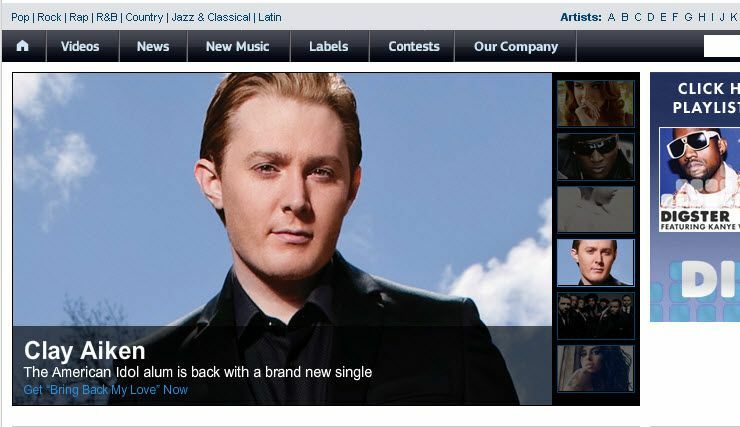 Clay Aiken blogged on January 1, 2012. What a great way to start the New Year! Personally, I loved reading the enthusiasm in Clay’s blog. His writing was filled with exciting anticipation and hope for a spectacular year! We already know that Clay will be busy on his “secret project” for a few months…we also know that Clay has a wonderful new single that has “hit” written all over it. And, there is a hint that a tour might happen this year!! It already sounds like Clay will be busy! But…we all need to be busy too. There are many things that we can do to support Clay this year. All of these suggestions are easy and in no way are interfering with Clay’s professional team. Follow Clay on his Official Twitter account. Whether Clay tweets or not, this is a great way to show support. There is no doubt that UMG keeps track of these numbers. If you are not a fan of Twitter, just follow Clay and use it only when some special news needs to be spread about. Go to TWITTER Just ask for help if you need it! Click on Internet articles about Clay and then leave a comment. Comments are a way to let the site and author know you like to read positive things about Clay. These sites want lots of hits so if they think Clay will give them hits they will write more. Keep your comments short and simple…make it a thank you and maybe a comment. Gift a download of Bring Back My Love to all your friends who have Internet access. If they hear it, they will like it! Wait for word from Clay and his team before contacting radio stations. We want to do it correctly as this is important. We don’t want to annoy the stations. The most important thing we can do is to have fun!! Enjoy the time…I bet you are smiling right now!! For more information on the importance of social media numbers: BigChampagne.com is a web site used primarily by entertainment industry professionals, major brands and their advertising agencies, and Wall Street analysts to access information about the popularity of music, film, and television as it is distributed and sold. BigChampagne’s sources for data include retail accounts (point of sale), traditional radio and television broadcasters, internet radio broadcasters, internet on-demand streaming services, social networks and blogs, mobile device streaming and downloading services, as well as file sharing networks. BigChampagne’s tagline is, “Now you know everything. Excellent blog! Thanks so much for all the reminders of how to follow and support Clay. I'm so looking forward to the wonderful things that await both Clay and us! I'm with MOButtercup! I'll be here doing what I can to vote, comment and just enjoy!! Thanks for the info. Guess I'll be busy today "getting ready" to help support Clay. It won't be much of a chore at all. Great advice on what we can do to best support Clay. Just to clarify so no one gets confused, go to Facebook and LIKE Clay Aiken, the artist. Yes, you could read the excitement that Clay was feeling as he blogged. Thanks for all the different ways that we, as fans, can support Clay.. How wonderful that the AC Radio stations will be getting a copy of Bring Back My Love in the next couple of weeks. It is easy to support Clay and his music. Please all who read here help us spread the word during 2012.
thx CANN for making it so easy. I need to bookmark this blog. Excellent clearinghouse of info. Listening to Clay Aiken's Bring Back My Love, and will be supporting him every way I can. Error: Error validating access token: Session has expired on Tuesday, 21-Aug-18 16:13:01 PDT. The current time is Wednesday, 24-Apr-19 06:03:50 PDT.